I know that you and many within our congregation want to offer hope and help to those in need. Presently, the best way that we can be of assistance is through prayer and our financial gifts. I invite you to join me and many others as we lift our prayers and offer our financial gifts to assist in the relief efforts now and into the future. Gifts can be mailed or delivered to our church office, and we will forward them to the agencies that are in the heart of the storm. Please make your checks out to Universal City UMC, with Harvey listed in the memo line. 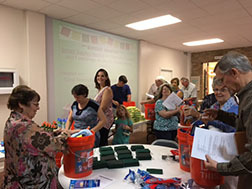 There is also an online portal at the United Methodist Rio Texas Conference web site https://riotexas.org/give or our web site at UCUMCTX.ORG.